Is battery storage a new growth area for inverters? Inverter makers are increasingly catering for battery storage even though the scale of the opportunity is still dwarfed by solar. Last week, for example, Eguana Technologies trumpeted Chinese patents for its Bi-Direx line of inverter platforms. Eguana Technologies chief executive Michael Carten said in a press release that the move was in response to growing demand for energy storage systems in China. “In less than a year, Eguana has emerged as the technology leader in storage electronics, and we have had multiple enquiries in the past few months from Chinese firms about gaining access to the Bi-Direx technology,” he said. In February, meanwhile, OutBack Power added advanced battery charge profiles to its Radian inverter family, which features an energy balancing system called GridZero. The company claims integration of energy storage and solar power will help generation plant owners maximise benefits and adapt to changing regulatory regimes. “These inverters represent future-perfect installation solutions for … locations where governments are changing solar incentives or utilities are modifying buy-back policies of surplus renewably generated electricity,” said OutBack in a press note. OutBack’s advanced battery charge profiles allow installers to specify specific charging profiles for lithium-ion, aqueous-ion, flow, fuel-cell and other battery types. A growing number of other inverter makers are also now taking account of energy storage needs. Last year, for example, ABB’s Power-One unveiled the REACT inverter-and-battery combo for residential solar customers. SMA, the inverter market leader, has a whole range, Sunny Island, destined for battery storage integration with solar power. 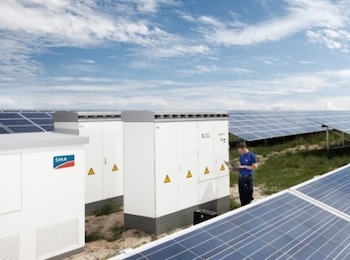 Other inverter vendors targeting the residential battery storage customers, particularly in mature solar markets such as Germany, include Kostal and FVG Energy. Meanwhile, companies such as Eaton, Parker and Princeton Power Systems offer inverters for grid-level battery storage. Particularly in the residential market, however, further moves to commercialise bespoke inverters will be needed as the energy storage market expands. Inverters make up a significant part of the total cost of battery storage systems and for batteries the inverter setup needs to be bi-directional, to account for charging and discharging. This is in contrast to most current inverter technologies, which have been developed for solar power and where energy flows in one direction. Until relatively recently, the range of bi-directional inverters on the market was so limited that companies sometimes had to resort to using two uni-directional units side by side, which was expensive and inefficient. This is changing, though. “Now there is a fair amount of work going on not only on the hardware side, having smarter configurations for the power conversion layout, but also in software,” says Logan Goldie-Scot, an associate at Bloomberg New Energy Finance.